OK - maybe it's not starting to look like Spring Break - no "boys in bikinis, girls with surf boards"* - but it sure does feel like it. No matter what the weather was like outside, it would be a warm and sunny day inside - thanks to the totally fun package of goodies that I got in the mail from Jen of the Piddleloop Sewing Team! I have long been smitten with this goldfish fabric. First I saw Autum use it in some of her bags at Creative Little Daisy; then she was sweet enough remember that I liked it and used it in the incredible apron and pillow that she made for me. So when I saw that Jen was using a companion fabric in her craftiness, I doubly smitten! I just knew that one of her clever pouches must be mine! Proof that good things can come in tiny packages - the goodness of it all! 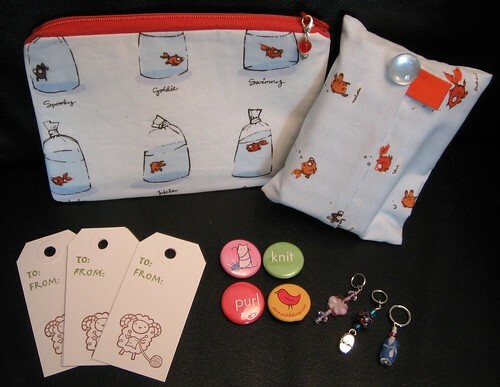 Darling knitting buttons, gift tags, stitch markers, and a Kleenex pouch, too! 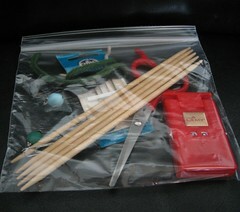 This little pouch is exactly what I needed to keep together all the notion-y things that I need for knitting. And do so in a much more stylish way than the Ziplock bag I've been using! rock lobster ohohohyea! rock lobster! ohohohohyea! b-52's. and those are some awesome goodies. LOVE that fishy fabric. Good find!! I like the fishes, but my favorite Lightening Bugs and Other Mysteries fabric has to be the gnomes. My brother and I watched "david the Gnome" on Nickelodeon and those little red hats totally take me back. We had your 72 beat today. I'm sure it was close to 80 here, not Christmas like at all. your notions really did need to be put in something! I can always send you more tags, just tell me how many you want. No charge. You just got to tell me before i blow thru all of them! Superb-cuteness! Although I have to take issue with such warm December days. I know you're in the South and all, but it is NOT RIGHT to have nearly every day in December in Boston in the balmy 50s and 60s, even nearing 70. We haven't had a hard frost yet this season. It's pretty terrifying, if you ask me. I picked up the fishy zipper bag too. it fits great inside my fishy project bag. there is something so darn cute about that fabric! Ooo, such cuteness! I really do love those goldsfih. Yep, nothing like wearing shorts while Christmas shopping. At least down here a front is supposed to come through in time for the big day. we have the same stitch counter! we have the same stitch counter! okay, like who else doesn't have this stitch counter?